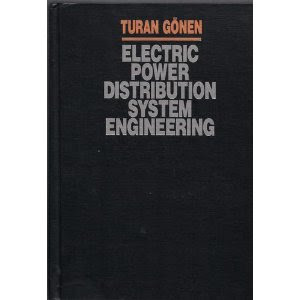 This is one of the first power systems textbooks to concentrate on modern electrical power distribution engineering. The book contains nearly 100 detailed numerical examples and about 125 problems, giving students ample exposure to and practice in solving and design of distribution systems. Dr. Gonen's book on electric power distribution is an excellent resource guide for all levels of distribution engineers. This book contains a wealth of information covering all aspects of distribution engineering from basic system planning and concepts through distribution system protection and reliability. Considering the wealth of information "Electric Power Distribution System Engineering" covers, this book is thoughtfully laid out with excellent diagrams and very useful examples and charts. Distribution planning and design considerations are especially well noted with emphasis placed on the analysis of subtransmission lines and distribution substations through the analytical design of primary and secondary systems. When considering these systems, Dr. Gonen has went beyond the usual analytical and qualitative analysis of the subject area and has injected a great deal of emphasis on the economical explication and overall impact of the distribution design considerations discussed which should be especially important to distribution engineers in coming days of utility deregulation and cost cutting. This book also goes into great detail on capacitor banks and voltage regulation, other very important aspects to distribution engineers as utilities continue to handle power quality issues and attempt to reliably "squeeze" the most out of their current system capacity. In the final chapters, distribution protection and reliability are firmly covered with topics analyzing fuse and recloser coordination and design to fault analysis and distribution system reliability issues. I personally had a chance to be tutored under Dr. Gonen and found out first hand the knowledge, wisdom and experience Dr. Gonen has within the field of distribution engineering. He brings to the table years of experience and his background and knowledge in this field of study are thoughtfully compiled in this excellent book on distribution engineering.